The last few months have been consumed with coffee. When Cora was born, I took advantage of my 30-day parental leave and immediately started writing obsessively. A project that I had started last year had understandably fallen on the back burner. Before I knew it, Coffee in Christian Ethics was the only non-family thing I could think about. 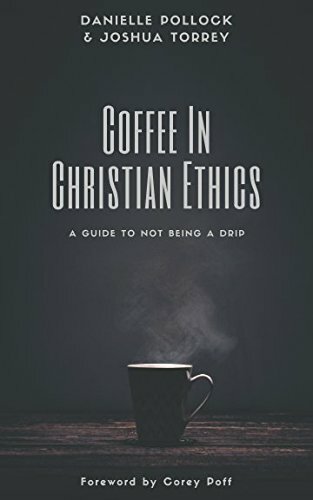 Coffee in Christian Ethics started in a not-so-Christian way as a string of lament and complaint tweets about the utter lack of coffee etiquette in the world. Needless to say, the world is fallen, and this turning in on ourselves is reflected in our treatment of coffee. In the scope of 140 characters, there are only so many jokes, stories, and general clarifications that can be made. There are only so many Twitter rants and puns that faithful followers can endure. So in those jokes, the writing of a book was mentioned. An idea was formed. A cover was made—before a word was written. A title was picked out to reflect a predominantly Christian readership. A Google document was started and the words started to pour. Though started in 2016, by early 2017 the “book” only looked like a dreadfully long blog post. Then it turned into something more. With an e-book deadline on the calendar, the words started to pour out rapidly. Eventually, there was even enough for a paperback. Now what sits in front of you is a string of bad theology jokes, snark, and generally useful information about coffee. And we’re proud of every ridiculous line. We love coffee. And somewhere in this whole adventure, we fully embraced that. We aren’t concerned if people read this book so long as they enjoy coffee. We tried to write in a way that people won’t need to enjoy coffee to enjoy this book. But we do hope that every reader learns a little something along the way and follows us on Twitter (@benNuwn and @impudentearworm). This whole effort comes from a place of love. Or at least a place of love for snarky (dis)interest in the people who don’t have good coffee ethics. So, if you’re one of those people please do not get offended. Call us up and we will gladly go get coffee to work things out. The name of our silly ode to coffee comes from the pen of Greg Bahnsen. His Theonomy in Christian Ethics is well enough known to play off of in jest. Meaning him no disrespect, we didn't want people to take our own work too seriously. But now that the book is done, it is time to return to some important things. Danielle and I hope you enjoyed the fun.